ControlTrends coverage of the 2017 Haystack Connect begins among hundreds of industry experts, systems integrators, specifying engineers, and end-users — all mingling in a vendor-rich reception, an amazing and exciting testament to the growing Haystack community and ecosystem. As key Haystack Connect organizer, Marc Petock tells us, “This year’s theme is ‘Data Gets Real,'” and there will be many real-world examples featured, where Haystack is being used to deliver large-scale, high-level management strategies and solutions. Project Haystack’s Executive Director, John Petze sums it up best, “The world is coming to us through data, and a key challenge is having that data describe what it means. And this year’s Haystack Connect will be the best technical program ever.” After a cursory review of the scheduled DAY 2 and DAY 3 technical breakout sessions, there’s no doubt about it. At this date and time in our industry, 2017 Haystack Connect is the place to be. Haystack Connect 2017 Update! Keynote Speakers & Technical Program & The IBB is Getting Back Together! Make your reservations for Haystack Connect 2017! There are, technically, a lot of reasons to attend Haystack Connect 2017. Now, we added some fun ones! See below. Register Today! 3-Day Technical Conference at the Saddlebrook Resort Tampa: See the very latest software and hardware solutions for the Building Industry exhibited in the Vendor Showcase. Meet and network with leading experts in our industry that are implementing real solutions that combine diverse devices, systems, data and protocols. Learn how Project Haystack standards and Haystack “tagging” are creating “Smart Data” to streamline engineering and deployment of smart devices, smart equipment, smart systems and smart buildings. The IBB is getting back together and looking for back-up singers to be part of the “Petockettes”! One of the most important reasons to attend Haystack Connect 2017 is the high-quality Technical Program – educational sessions by industry experts that get to the real issues and solutions in connecting smart devices and their data into solutions. All of the Sponsors will be exhibiting their latest products in the Vendor Showcase. You won’t want to miss this! View the full Technical Program at www.haystackconnect.org/technical-program and the full lineup of Speakers at www.haystackconnect.org/speakers. The IBB is Getting Back Together! Richmond, Virginia – November 2, 2016 – Project Haystack (www.project-haystack.org), a non-profit, 501(c) organization focused on developing common standards to streamline the interchange of data among today’s smart devices, systems and equipment, today announced the Call For Speakers for Haystack Connect 2017 and the latest additions to the list of Sponsors. 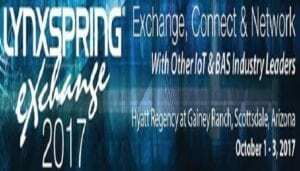 Taking place May 8 – 10, 2017 at the Saddlebrook Resort near Tampa, Florida, Haystack Connect 2017 is Project Haystacks open-forum biennial conference that provides a unique opportunity for professionals involved in automation, control and the Internet of Things to learn and share the latest techniques for connecting systems and utilizing device data in applications, including intelligent buildings, energy management, remote monitoring and other smart-device applications. The technical sessions for Haystack Connect 2017 are starting to take shape, covering a wide range of topics that will include Data Modeling, Next-Generation Hardware, XaaS, Analytics, Data Visualization, Large-Scale Systems, Energy, Financials, Security, and more. The community that Haystack Connect serves is encouraged to share their experiences and submit abstracts of proposed presentations. The Call for Speakers is open until February 1, 2017 and can be submitted online at www.haystackconnect.org/call-for-speakers. It was also announced today that there are 5 additional sponsors and exhibitors to the line-up, with new companies signing up every week. Recent additions include Automated Buildings, CABA, Contemporary Controls, ControlTrends and IoTium. Its a known fact that machine data can produce amazing results  its also known that it takes real work, knowledge of the underlying systems, and new skills to implement successful data solutions. The Project Haystack community is singularly focused on addressing the real-world challenges involved in using machine data to create and drive value. Haystack Connect 2017 will be the place where data and creating value from it gets real. The sponsors, speakers, and technical program will provide attendees with the most concrete, factual information available. This Information will help owners, operators, and systems integrators and end-users separate reality from hype. Vendors will present solutions that demonstrate their tangible value from hype-filled claims that gloss over the real-world challenges. To get the real story and see the real technologies that are changing our physical world, there will be one place to be  Haystack Connect 2017. More information about Haystack Connect 2017, the Call for Speakers, Attendee Registration and Sponsorships is available at www.haystackconnect.org. Attendee Registration for Haystack Connect 2017 is now open and an Early Bird registration discount is available through January 31, 2017. Online registration is available at www.haystackconnect.org/register. Since its formation in 2011, the Project Haystack Organization has grown tremendously providing the industry with an open-source, collaborative environment where people and companies work together to address the challenge of utilizing semantic modeling to streamline the interchange of device data among software applications. The devices that make up the Internet of Things – automation systems, metering systems, sensors and smart devices – produce tremendous amounts of data. This data is very hard to organize and use across different applications because it is stored in many different formats, has inconsistent naming conventions, and very limited data descriptors. In essence, data lacks information to describe its meaning. And, without meaning, a time-consuming manual effort is required before value can be derived from the data. To address this challenge, the Project Haystack community has defined an easy-to-use methodology to describe the meaning of data using a simple, extensible data-tagging approach and standard models for common equipment systems. The community-developed material includes detailed documentation describing the data modeling techniques, significant libraries of equipment models, and software reference implementations allowing software applications to easily consume smart device data that is marked up with “Haystack Tags”. These data descriptors allow software applications to automatically consume, interpret, analyze and present data from IoT devices, smart equipment and systems. More information about the Project Haystack Organization is available at: www.project-haystack.org. Thanks to the volunteers that implemented these great enhancements. Information about the Project Haystack Organization and membership is available at www.project-haystack.org. Haystack Connections Magazine Now Available in French! Since its formation in 2011, The Project Haystack organization (a 501c non-profit trade association) has grown tremendously providing the industry with an open-source, collaborative environment to address the challenge of making data self describing through the use of semantic modeling also known as data tagging. The work developed by the Project Haystack community streamlines the process of managing, presenting and analyzing the vast amount of data produced by smart devices and equipment systems. Project Haystack techniques can be used with virtually any type of system and device data and is not tied to any vendor or communication protocol. More information about Project Haystack is available at: www.project-haystack.org.